The Venezuelan government, having proceeded with its National Constituent Assembly to peacefully resolve months of political unrest, reiterated its position to maintain a healthy dialogue with the United States based on international law, mutual respect, peace, and security in the region. 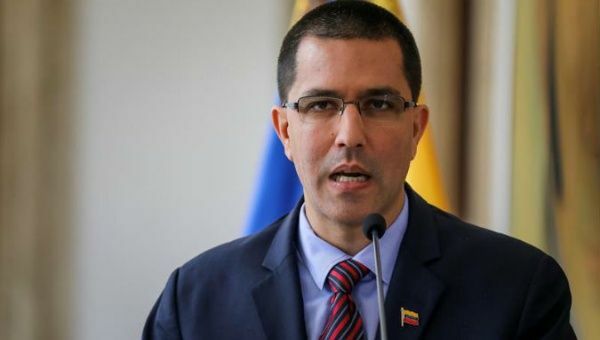 Venezuela’s Foreign Minister Jorge Arreaza made the case clear during a Saturday meeting with Lee McClenny, the U.S. Chargé d’affaires in Venezuela. He stressed that threats against Venezuela and the region are “deeply hostile, disrespectful, condemnable, abject,” adding that a war against the Latin American country would result in “15 Vietnams,” for Washington and its troops. According to Global Research, the United States has been at war 93 percent of the time since 1776: 224 out of 241 years has been marked by some type of U.S. military combat. Trump’s threats of U.S. military action against Venezuela were quickly condemned by several countries in the region, even right-wing governments that have sided with the United States in their attempts to intervene in the internal affairs of Venezuela. Mercosur, which ousted Venezuela from the trade group a few weeks ago, also issued a statement criticizing Trump’s threat. “Mercosur considers that the only acceptable instruments for the promotion of democracy are dialogue and diplomacy,” the statement said. Ecuador issued a statement which read, in part, that it “reminds the international community that the declaration of Latin America and the Caribbean as a zone of peace implies the commitment of all nations to preserve our common territory free of threats or military interventions of any kind. In this context, it expresses its solidarity with the Bolivarian Republic of Venezuela and rejects any threat of possible military intrusion into its territory. Ecuador reiterates the call for dialogue as the only way to solve the situation of the brother Venezuelan people.